There were at least 50 photographers named Baker in the cabinet card era. There were four of them in Ohio. 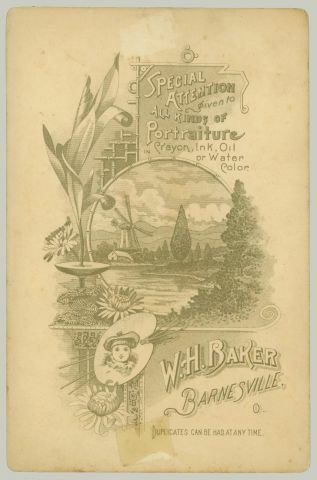 To complicate searching a bit, there were several other men named W H Baker in Ohio during that time. They were policemen, farmers, judges, pastors and politicians making appearances in the newspapers more often than the photographer. 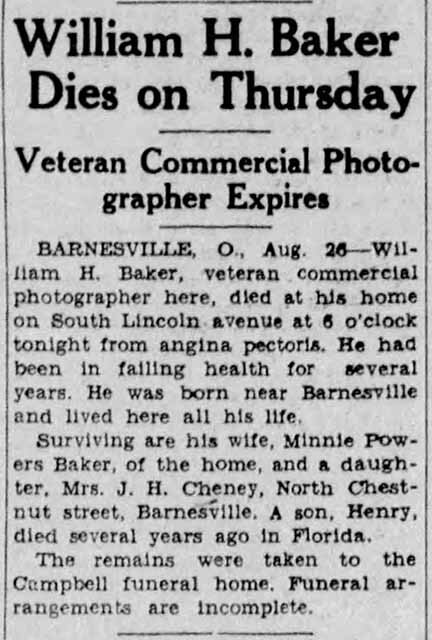 There was also a jeweler named W H Baker living in the same town of Barnesville. 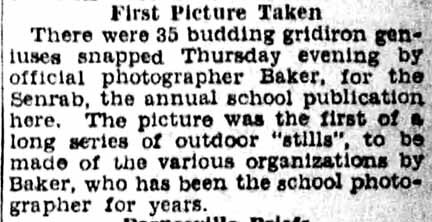 It appears that this photographer was well known for doing school class photographs. The event is documented a couple times in the newspaper. 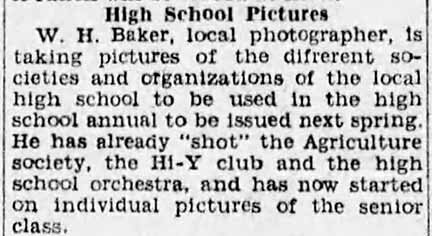 Zanesville, OH, Times Recorder news item says it is the first time since 1919 that the high school annual photographs will not be taken by W H Baker. The example here could have been taken any time between about 1888 and 1931. 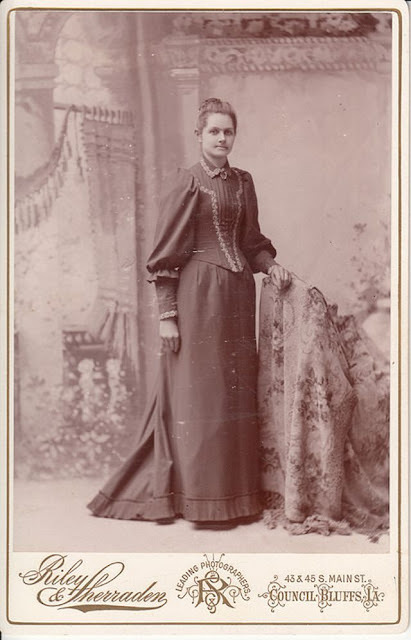 The design of the card would indicate it was close to 1900 as cabinet card popularity was decreasing after that time. 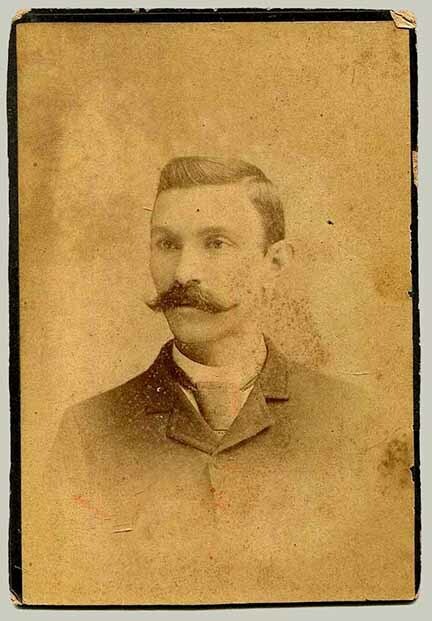 From the collection of rfinch on Ancestry.com. C O Heilmann was born in Norway and came to America in 1886 at age 16. His career in photography appears to be all in Waco, TX. 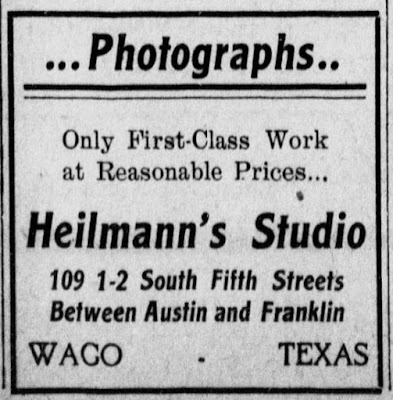 All mentions of his studio that were found, placed it at 109 ½ s 5th in Waco. 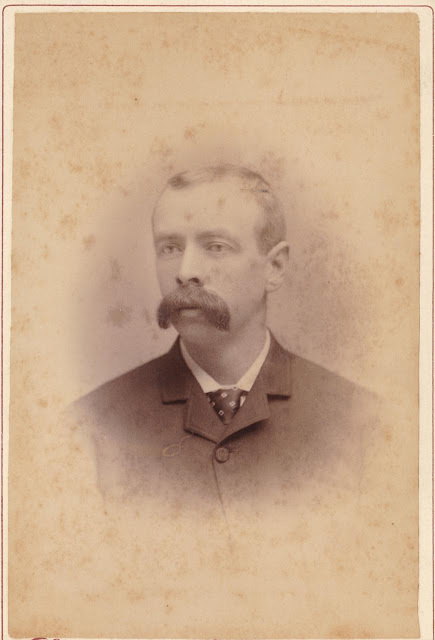 His active years were from about 1891 through 1919. He died of stomach cancer after a long illness in 1919. Heilmann probably shouldn't be counted as a 19th century photographer as he worked as photographer only a few years before 1900. 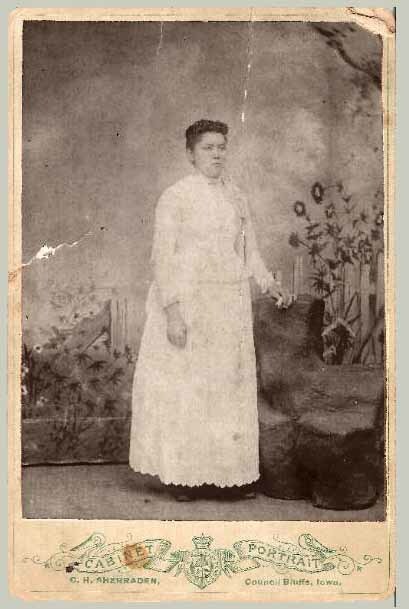 Further no examples have been found of a tintype, a cabinet card or a CDV, common with the 19th century photographer. He appears to have been on the cutting edge of "Modern" photographers. 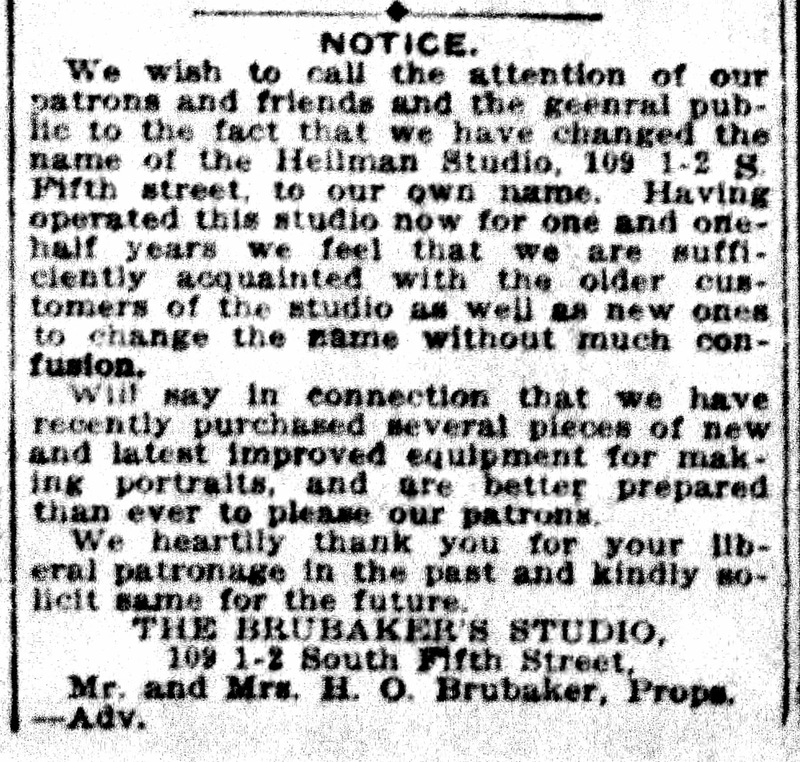 This same ad ran at least 7 times between Oct 28 and Dec 23, 1910. 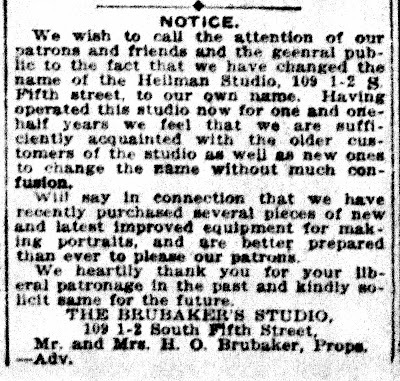 This brief ad ran several issues between in 1909. This announcement was at the bottom of page 6. 43 & 45 S. Main st. 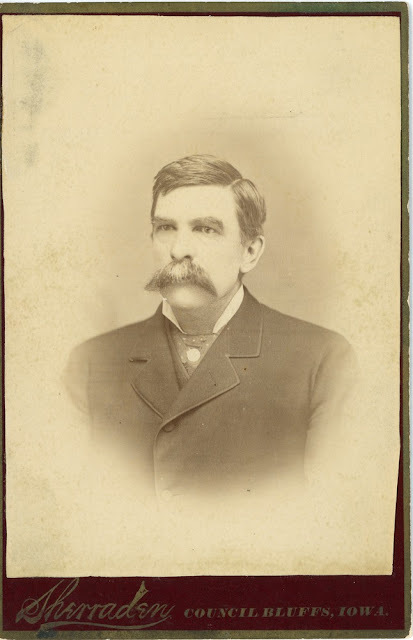 Although the US census of 1900 finds Sherraden in Council Bluffs, IA, on June the fifth, the 1900 city directory for Salt Lake City, UT, also lists him at 329 D F Walker building. 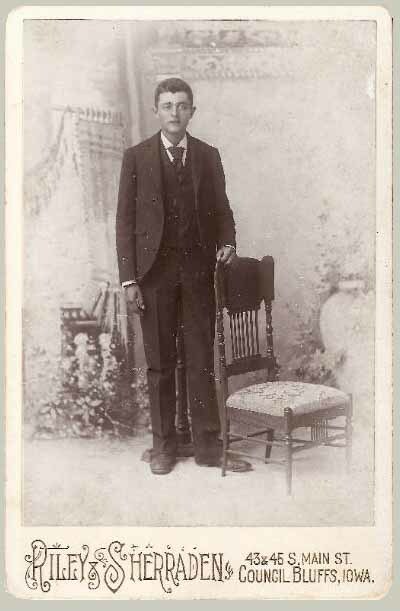 There is no doubt this is photographer Sherraden, as the 1906 Utah death certificate also lists the correct names of his father, mother and wife. 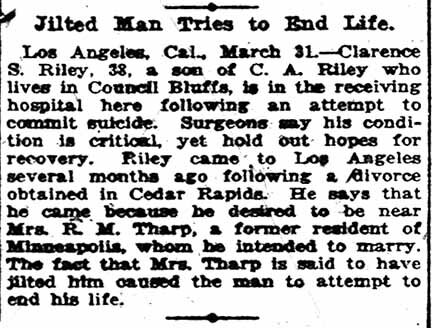 C. A. Riley and C. H. Sherraden worked together at least twice. 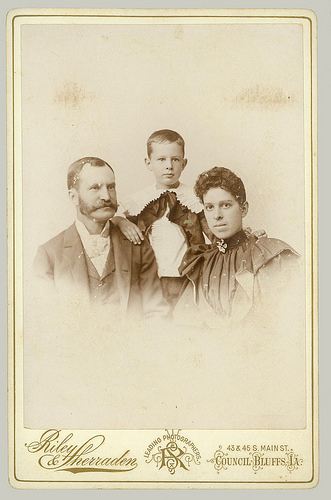 The cabinet card at the left was probably done during their later 1893 - 1894 collaboration. 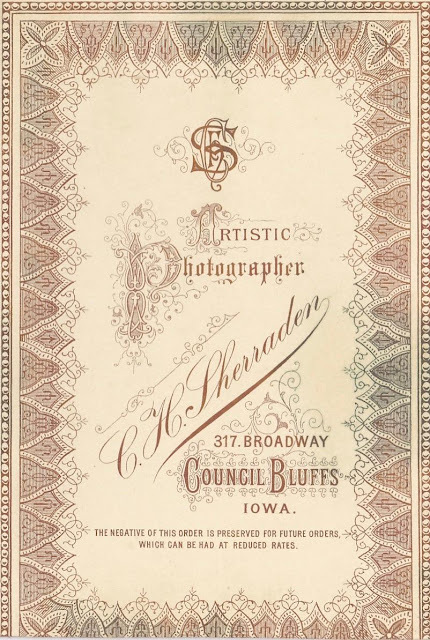 Sherraden apparently leaves photography AND Council Bluffs, IA, late in 1900, and never returns. 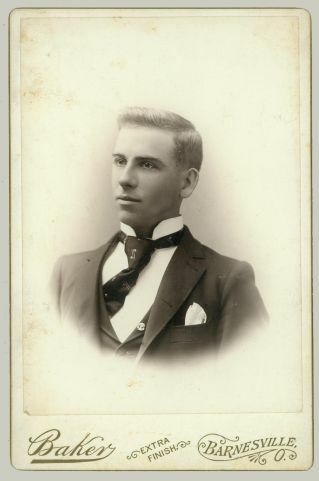 Two examples below, of cabinet cards by Sherraden are imprinted with the 317 Broadway address that Riley occupied between 1907 and 1921. No city directories or other records have been found placing Sherraden at that address so it could be assumed that he was there only a short time. It could be speculated that it was just before he left for Salt Lake City, UT, in 1900. There are two examples at the Snoqualmie Valley Museum. 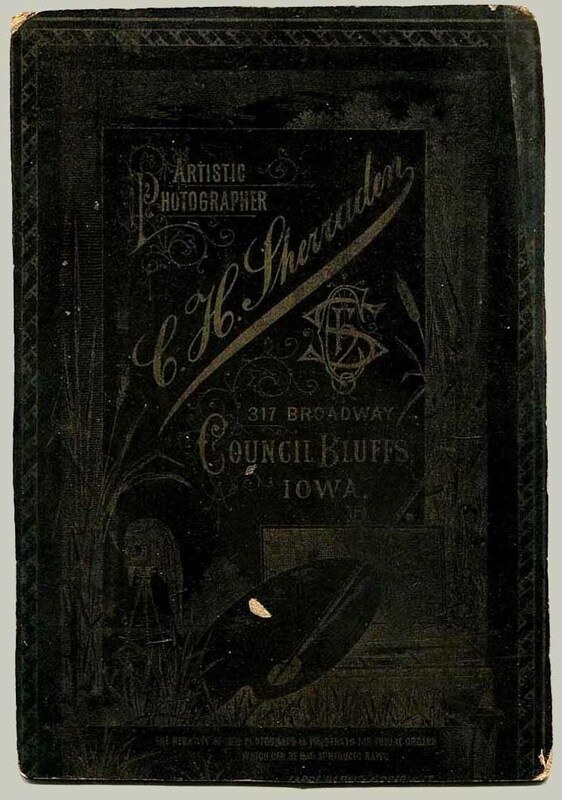 Reverse sides are not shown but accompanying information says these were made at 317 Broadway, Council Bluffs, IA. Note the example on the right shows the font and logo design, the ruled line and the rounded corners are the exactly the same as the example at the top of the page. It was probably finished about the same time. Reverse of the card on the left. 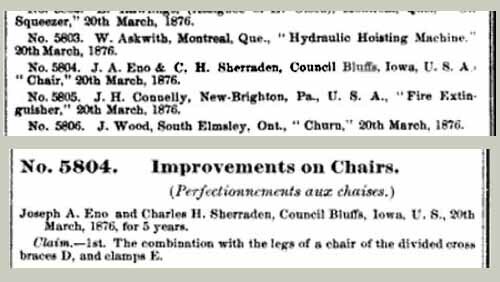 It appears C. A. Riley worked with C. H. Sherraden on at least two occasions. The first time was around 1880 when he was apparently learning the photography craft. Then they worked together from 1893 to 1894 at 43 & 45 Main. Two examples of cabinet cards by Sherraden are imprinted with the 317 Broadway address that Riley occupied between 1907 and 1921. No city directories or other records have been found placing Sherraden at that address so it could be assumed that he was only there a short time. It could be speculated that it was just before he left for Salt Lake City, UT, in 1901. 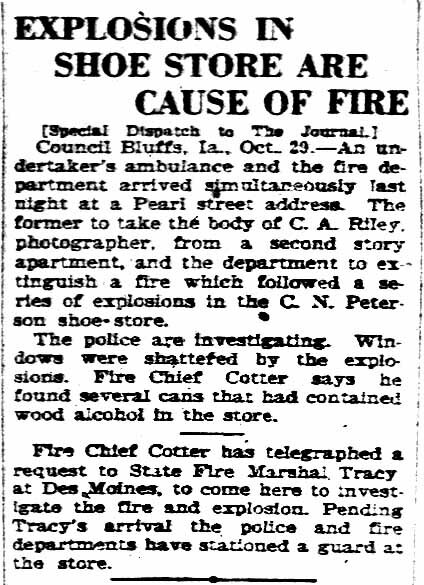 Except for 1904 to 1906 when Riley worked in Linn, IA, all the rest of his photography appears to have been done in Council Bluffs, IA. 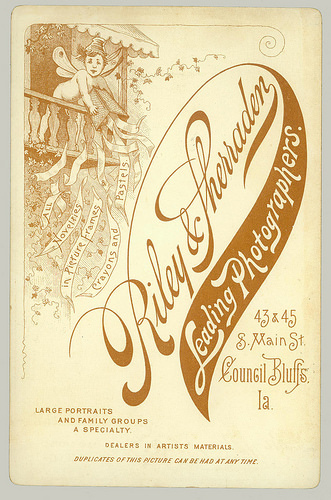 In 1907 he established the Riley Studio at 317 Broadway in Council Bluffs, IA, and remained there until 1921. 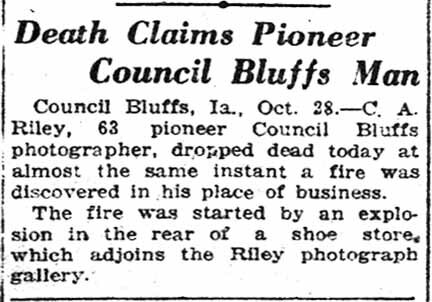 The 1922 Council Bluffs, IA, city directory says his studio address is then 12 Everett block. He had studios on Broadway at 301, 404, 402, and finally 317.